Happy Holidays! We’ve featured many classic yuletide albums here at keithhirsch.com over the years. For the 2017 holiday season, we will take a look at something a bit different. It is a 1986 album performed by Art Garfunkel and Amy Grant entitled The Animals’ Christmas by Jimmy Webb. The album has an extensive list of performers. Joining Garfunkel and Grant are Jimmy Webb on piano, The London Symphony Orchestra conducted by Carl Davis, and the Kings College School Choir directed by Michael Jenkins, among others. The Animals’ Christmas is not a compilation of classic Christmas songs and carols. Rather it is an assortment of original compositions by Jimmy Webb, along with other songs adapted by Webb. Importantly, The Animals’ Christmas is able to bring together pop artists, an orchestra, and a choir into a balanced mix that just works. Columbia Records released The Animals’ Christmas in October of 1986. The album was released on CD in the U.S. under Columbia catalog number CK 40212. A unique feature of this release is that lyrics for the 12 songs are provided in four languages — English, Spanish, French, and German. 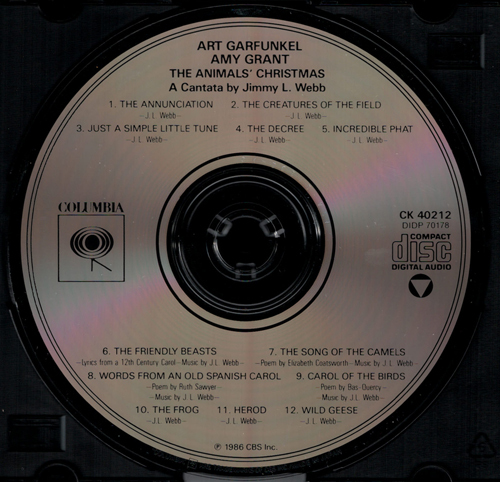 By 1986, the Japanese CBS/Sony plant was no longer supplying CDs for the U.S. market, but there is a Japan-for-U.S. pressing of The Animals’ Christmas. This particular disc was pressed by JVC. As has been discussed here in the past, the Japanese JVC and Denon plants pressed a number of CBS Records titles for the U.S. in the mid-’80s to meet growing demand. Such Japan-for-U.S. pressings are typically rare. The Japanese pressing of The Animals’ Christmas bears the typical plain label design of U.S. CBS CDs — just black text with no paint coating and two black rings along the perimeter. The disc has “MADE IN JAPAN” printed along the perimeter. The project ID number “DIDP 70178” is printed beneath the catalog number at 3 o’clock. The matrix code is “CK-40212 A2E13”. It is unlikely that any selection from this album will be heard on a Christmas radio marathon, so pick up a copy of the album and enjoy something different this holiday season. Shown below are the cover and back insert for The Animals’ Christmas, along with the Japan-for-U.S. pressing. 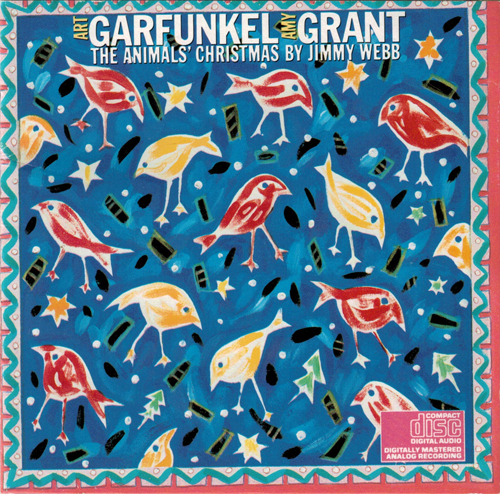 The cover artwork for Art Garfunkel and Amy Grant The Animals’ Christmas by Jimmy Webb (Columbia, catalog number CK 40212). This is the standard cover for this album. 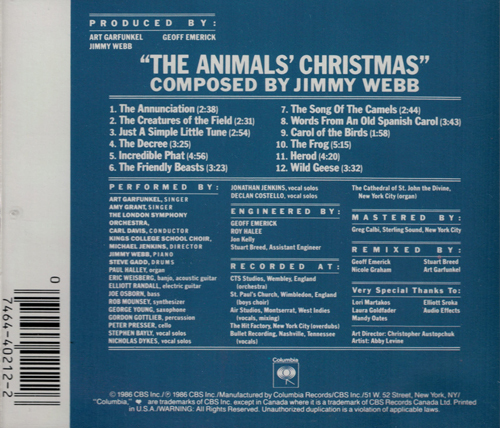 The back insert for Art Garfunkel and Amy Grant The Animals’ Christmas by Jimmy Webb (Columbia, catalog number CK 40212). The extensive list of performers is provided below the track list. The Japan-for-U.S. pressing of Art Garfunkel and Amy Grant The Animals’ Christmas by Jimmy Webb (Columbia, catalog number CK 40212). The disc was pressed by JVC. Although difficult to see in this picture, “MADE IN JAPAN” is printed along the perimeter. The matrix code is “CK-40212 A2E13”.